Ever since Wargroove was revealed by Chucklefish, it has been on my radar and the wait has been pretty painful for the release over the last two years. 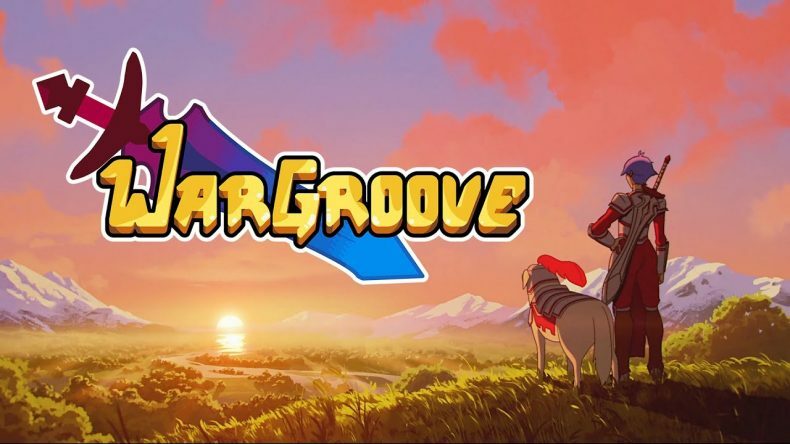 This past Nindies Showcase saw it go up for preload on the eShop but more importantly, the 2(ish) year wait had finally come to an end because Wargroove had a confirmed date on not only Switch but also PC and Xbox One. Wargroove begins pretty slowly mechanically, but new features and mechanics are introduced at a steady pace. Initially, there is a lot to take in with examining units, map flow, and learning about the various units, but things never get out of hand. You follow Mercia, who has recently become Queen and is still proving her worth as a warrior. Mercia’s father was just killed and her journey takes her across various lands meeting all sorts of unique characters from different races, some of whom she befriends for the journey. While the premise itself isn’t mindblowing, the delivery is what makes Wargroove special. Character development is great for the main commanders and the cutscenes sprinkled before and after missions are ace. There are some big surprises throughout and I quite liked the conclusion to the tale which happened 30+ missions into the campaign. Some of the later missions could definitely be better balanced or have checkpoints because they can get really long. 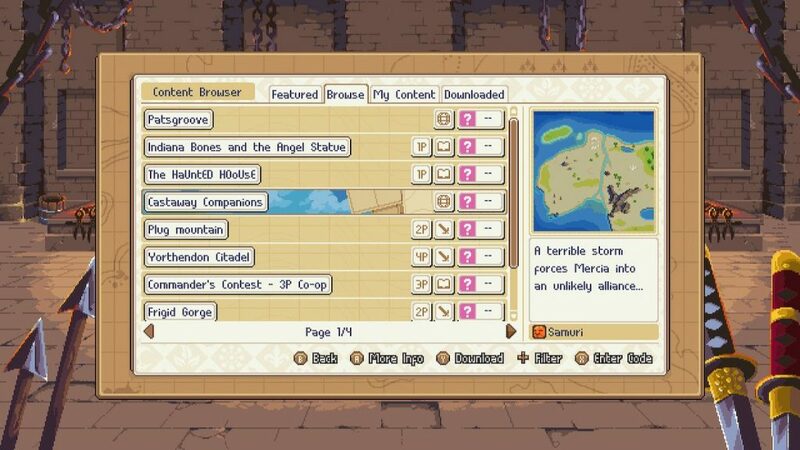 Unlike Fire Emblem that has a few difficulty options, Wargroove has three sliders allowing you to tweak the challenge as you wish. This will limit how many stars you can earn but it is a welcome addition for players new to the genre. When it comes to the amount of good stuff Chucklefish has packed into the release, there’s almost too much. The meaty campaign isn’t the only single player content here. Once you make your way through the various main and side missions across each act here, you unlock the Arcade and Puzzle modes. The Arcade Mode lets you play a set of 5 maps per character (you can unlock characters for Arcade mode by completing specific side missions across the Acts in the Campaign) while the Puzzle Mode is a smart mode that asks you to accomplish a certain task in a single turn. There are loads of puzzles available the moment you unlock the mode. I feel like the creation suite here could’ve been sold as its own game because it works great. You can create maps and campaigns. The campaign creation also has a cutscene creator that takes a little while to get used to. The best part about the strong creation suite here is that all creations can be uploaded and downloaded across any platform. This is going to give the game super long legs. I feel like a lot of people will end up double or triple dipping on this game just to be able to play it everywhere and have the convenience to create stuff on another platform. I can see many people getting this on PC to create stuff and Switch to play everything on the go. I know the Switch can be docked but it is definitely going to be easier creating levels using a mouse. Wargroove looks great in both docked and handheld modes. The sprite work is fantastic and the animations are even better. One aspect I wanted to highlight is how certain little things like a smirk get a nice glint animation that is great. The maps are all well done and the individual element tiles have been well thought out considering the creation aspects here. There are also various terrains that not only look different but also feel different because of geography. Performance is one aspect the Switch version needs a bit of work on. Some transitions between menus have a stutter here or there but only the first time. It isn’t major but it happens enough to be noticed each time I boot it up to play a quick map. The actual gameplay is great though in both modes. Being able to set combat animations to be skipped is always welcome because I usually get bored of seeing grunt combat animations fairly quickly. I used the setting that only shows commander animations for my time with Wargroove after playing a few hours with everything on. There is the issue of the commander sound playing out even after the animation has been skipped and you’re doing something else on the map. 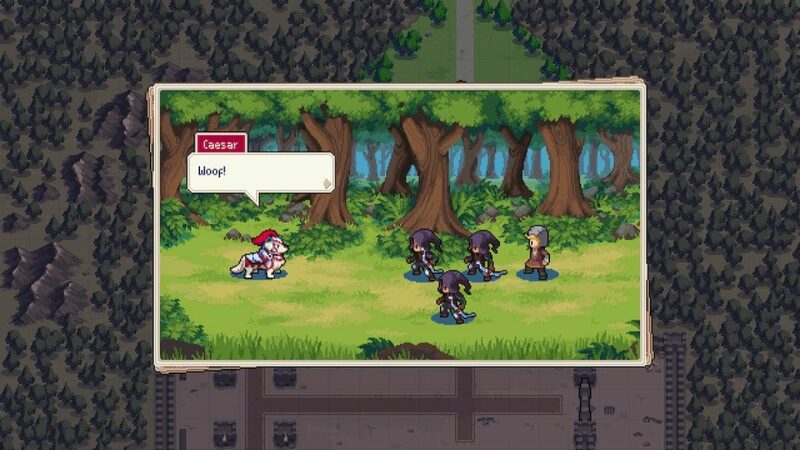 Wargroove has a decent amount of voice acting for the main characters. This ranges from some short words or expression sounds to full sentences. The voice acting is very good and I even recognised some of the voices from other games, like Sean Chiplock, who I know as Rean from Trails of Cold Steel. The music is excellent. There are character specific themes that fit well with the personalities but the real standout is the outlaws music alongside the main theme. Without getting into story spoilers, there is one late game mission with a song that absolutely reminded me of The Battle for Everyone’s Souls from Persona 3’s final battle. When it comes to Switch specific features, Wargroove does a pretty good job overall. While there sadly isn’t any touchscreen support, there is a zoom mode setting for handheld and tabletop play. By default, this is set to “Near” which is how I ended up playing most of the game. The “Far” setting is has the same size aspect ratio as docked play and it gets a bit too small in handheld mode. Thankfully, it switches (yes, I did that) on the fly. Wargroove also has a nice touch where the controller vibrates when it is your turn and this ended up being super useful when I was playing it without sound at Starbucks and not paying attention to the enemy turn. The pickup and play nature and being able to save and quit makes this (sorry, Adam) perfect for Switch. I just hope the B and A for select gets sorted because it feels a bit inconsistent with some things needed a B to go ahead while others need an A press. January has been pretty tame when it comes to Switch releases, with other platforms seeing heavy hitters. Thankfully, February starts off with a bang and Wargroove is easily one of the best games I’ve played on the Switch and a contender for the best strategy release on the platform alongside Valkyria Chronicles 4, Into the Breach, and Mario + Rabbids Kingdom Battle. It is almost astonishing just how much great stuff Wargroove has right from launch day across the various in game modes, and I can’t wait to see the community creations for this game and basically keep coming back to it for new content. 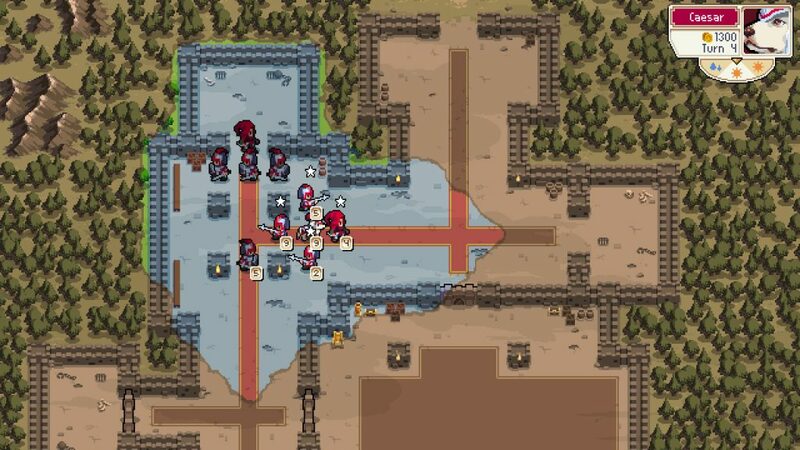 Wargroove is one of the best games I've played on the Switch and the perfect tactical game to get deep into while waiting for Fire Emblem Three Houses.